Isuwing was one of my closest and key informants during fieldwork in 1993-5, 1999-2000, 2006 and 2009. 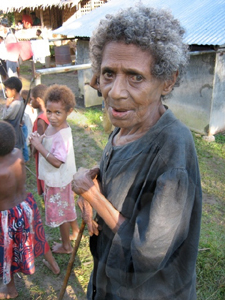 She was an acknowledged expert in many things, including the intricate and beautiful bark fibre skirts that Reite and Sarangama people make. She died in 2010. A description of the skirts and how they are made provided by Isuwing can be found in 'Waterfall, Movement, Life: Woven bark fibre skirts on the Rai Coast of Papua New Guinea', Ch 15 of Melanesia: Art and Encounter (eds) L. Bolton, N Thomas, E Bonshek and J Adams, London: British Museum Press. 2012. 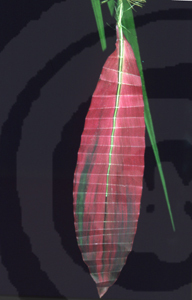 Cordyline leaf, folded and suspended for ceremonial decoration by Reite Villagers. These folded and suspended leaves adorn ceremonial structures and the hamlets that contain them during important events on the Rai Coast.